1. 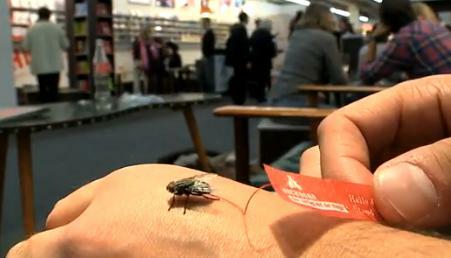 A creepy publicity stunt involving flies carrying little paper advertisements at the Frankfurt Book Fair. Doesn't this make you feel bad for the flies? 2. San Francisco Beat/hippie poet Lenore Kandel has died at the age of 77. Here's an appreciation of her work by John Yates. 3. Carl Jung's awesome visual side. 4. A detailed financial biography of F. Scott Fitzgerald. (And why not? Money was certainly among his major themes). 6. Guernica Magazing is turning 5! Jonathan Ames, Howard Zinn, Katie Halper, Mia Farrow and David Byrne will be joining the party this Wednesday, October 28. Wish I could make it (but I can't). 7. The eternal philosophical battle over the real-life ethics of German intellectual Martin Heidegger goes on. Personally, I don't agonize over Heidegger's Nazi past, because I never thought much of his work. You can find the same message -- the utter immediacy of existence -- in Nietzsche or Kierkegaard or Sartre, and with a lot more finesse and humor. 8. Building a brain inside a supercomputer. And here I am just trying to get Drupal to work. 10. Jeff Kinney's Wimpy Kid is rocking the cash registers. My stepdaughter reads these books and I think they're hilarious. 11. I love this, from McSweeneys: YouTube Comment, of e. e. cummings?. 12. HTMLGiant on Glimmer Train: "Winning one of their ubiquitous contests is like winning $2 on a $2 scratch ticket or a free small soda during McDonald’s Monopoly promotion." They also admit that Glitter Train was once "a decent, if not rather traditional literary magazine". I used to read them, but I don't read print literary journals much at all anymore. 13. If you've been reading my memoir, some of these events will be familiar: A History of the Internet from 1969 to Today. 14. Speaking of bygone times, one-time high-rolling community website GeoCities is shutting down. Caryn is sad about this, and xkcd posted a tribute. 7 Responses to "Les Mouches"
Heidegger was before Sartre -- whose Being and Nothingness he wrote after reading Heidegger's Being and Time -- and Heidegger's language was great but it is too bad he couldn't write as well as Bertrand Russell. There's nothing for me that Heidegger has to say and I can never stop thinking of him as a Nazi; but I say that being mostly uninformed of his work, having only scratched the surface and only having scanned Being and Nothingness, do not know how much they have in common besides being thick as phonebooks and dense. I didn't know about him being a Nazi Party member until the day before last in my existentialism class and I was the one who brought it to the class's attention and no one cared. An aside: Kierkegaard's leap of faith falls flat. The new book about Heidegger sounds like a hatchet job. Kierkegaard, Sartre, and Heidegger are all featured in Oxford University Press' A Very Short Introduction Series. The late Richard Rorty referenced Heidegger, one arguement not to ignore him. You may be right about the new book being a hatchet job. I would not suggest ignoring Heidegger because he was a Nazi -- but I do think he's overrated. I also think the Nazi intrigue adds to his mystique for some readers (similar to how some readers are only fascinated by William S. Burroughs because he killed his wife). I just don't think his work stands up very well today. Sipping coffee at the Frankfurt Book Fair, I casually waved away a buzzing insenct, thinking no more of it until a squeaky, tiny voice caught my attention, "Help meee!" Way to go, Micky Z! This is good news indeed. Sad. Geocities pioneered it -- giving anyone a place to easily make a web site. Now blog sites replaced that. I guess it will be gone. I never collected any of the stuff on it. It was all done on the fly. It was a type of blogging done before the blogging started. ah... i KNEW i'd miss something if i didn't go to frankfurt this year - and i was right! Advertising on flies.... what has the world come to? "This maggot brought to you by Coca-Cola!"